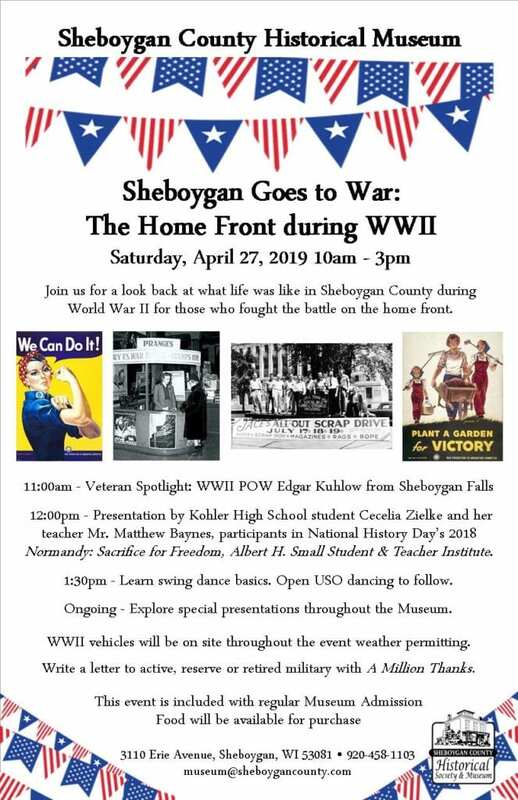 Join us for a look back at what life was like in Sheboygan County during World War II for those who fought the battle on the home front. 12:00pm – Presentation by Kohler High School student Cecelia Zielke and her teacher Mr. Matthew Baynes, participants in National History Day’s 2018 Normandy: Sacrifice for Freedom, Albert H. Small Student & Teacher Institute. 1:30pm – Learn swing dance basics. Open USO dancing to follow. Ongoing – Explore special presentations throughout the Museum. WWII vehicles will be on site throughout the event weather permitting. Write a letter to active, reserve or retired military with A Million Thanks.